There have been a slew of books in the past few years promoting what I would tentatively term a kind of ‘militant atheism’. The sensitively titled ‘The God Delusion’ by Richard Dawkins is a prime example, though authors such as the late Christopher Hitchens and others have also contributed heavily to the genre. In fact, Hitchens termed himself an ‘anti-theist’, which is perhaps a more appropriate description of the message that these writers – and organisations such as the British Humanist Association – espouse. While not an overly religious person myself, I have no objection to those of faith. And even as a physicist I am tending towards the view that science cannot explain everything and should perhaps stop pretending that it can. But I am highly dubious of any individuals or organisations, faith-based or otherwise, that try tell people what they should think, what they should do and how they should behave. 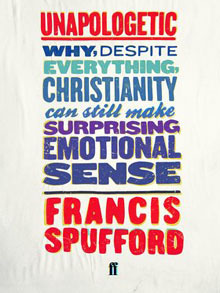 So it was with great delight that I stumbled upon Francis Spufford’s book ‘Unapologetic’. Short enough to be read over the course of a couple of lazy afternoons, it is a very personal – and well-written – account of the author’s relationship with Christianity. While it does not seek to defend Christian ideas, it does – as Spufford points out – spring to the defence of ‘Christian emotions – of their intelligibility, of their grown-up dignity’. And it does so with style, wit and grace. At the heart of the author’s narrative is the ‘Human Propensity to F**k Things Up’ (HPtFtU). * We all, he argues, screw things up from time to time. Usually, we can recover from these calamities fairly quickly, but sometimes they have more profound or far-reaching consequences. This doesn’t make us ‘bad’ or ‘evil’. It just makes us human. We’re bombarded constantly with images and ideas of how we ‘should’ be, which inevitably make us feel like pathetic excuses for human beings**, but we need to accept that we are who we are. We need, in short, to embrace our HPtFtU. From here, Spufford takes us on an almost ‘stream of consciousness’*** exploration through his own spiritual and religious experience. It’s not really an argument ‘for’ or ‘against’ religion or the existence of God, but rather the author’s own personal voyage of discovery into what he himself describes as not ‘the kind of thing you can know’. I’ll resist the temptation to go into more detail or to quote my favourite bits, though, because (a) the narrative – and, indeed, the topic – doesn’t lend itself to being summarised, (b) there’s no index and I can’t find the bits I want to quote, and (c) you really should read it for yourself. ** Or this might just be me. This entry was posted in Books, Life, Thoughts and tagged Books, Christianity, Francis Spufford, Life, Religion, Thoughts, Unapologetic by Simon Perks. Bookmark the permalink.